'Tis the season for gazpacho. Tomatoes are at their juciest this time of year which makes them perfect for this spectacular Spanish soup. Yellow tomatoes are blended with mango, white balsamic vinegar, olive oil and lime juice to form the soup base. Tons of tasty vegetables and aromatics are added to break-up the texture. Seasoned lump crab meat gives the soup a touch of elegance and bumps up the protein. For more summer tomato recipe ideas, click here. Step 1: Combine the mango, vinegar, lime juice, olive oil and tomatoes into the bowl of the food processor. Pulse the mixture until smooth. Season the soup with salt and pepper to taste. Step 2: Stir in the finely chopped bell pepper, cucumber, red onion, serrano pepper and fresh cilantro into the soup base. Taste and adjust seasoning as necessary. Step 3: Place the gazpacho into a large bowl, covered, and chill for at least an hour or overnight. Step 4: In a small bowl, combine the crab meat with the lime juice and cilantro. Season with salt and pepper. 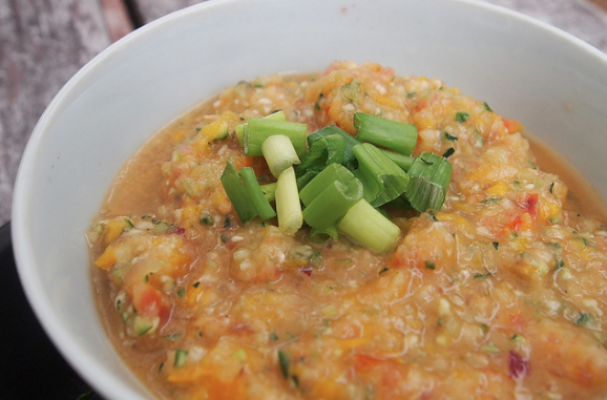 Step 5: To serve, pout the yellow gazpacho into a bowl and garnish with the seasoned crab. Editors note: The photo is only a representation of the recipe described above.